HERE IS HANDMADE SOLITAIRE NECKLACE ! FANCY BLACK DIAMOND SOLITAIRE PENDANT NECKLACE !! VINTAGE STYLE BLACK POLISH !!!!!! COMES WITH 16" OR 18" INCH CHAIN !!! NEW STYLE LOBSTER LOCK !! CENTER BLACK DIAMOND IS 3.50ct !! VERY DEEP BLACK COLOR & CLEAN DIAMOND !!! RETAIL PRICE IS OVER $9,000.00 !!! COMES WITH $6,500.00 APPRAISAL !!! Thank you for taking the time to view my store! All items are painstakingly handcrafted by me at my shop; located right at the heart of the New York City diamond district. The unparalleled jewelry designs I fashion are the product of over two decades of experience; which I earned alongside the world's most prestigious jewelry makers starting when I was twelve years old. 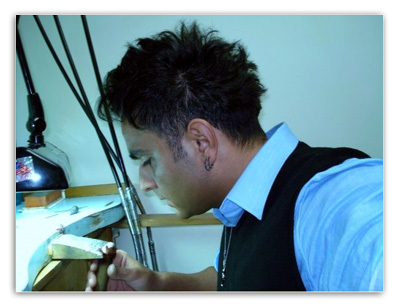 When it comes to my craft, I am committed to use only hand-selected diamonds and high quality fine metals; to bring them together with uncompromised attention to every detail, from the optimal position of each diamond within the item to the symmetry and consistency of its patterns. Notwithstanding the superior quality of my jewelry items, I also manage to make them unusually affordable; be assured that you will not find this uncommon combination of value and price anywhere else be it the internet or a retail store. When you purchase one of my items, you can be assured that the jewelry has been meticulously crafted, thoroughly inspected and proudly approved by somebody who believes absolute perfection is the only way to craft jewelry by hand that will last for generations to come.